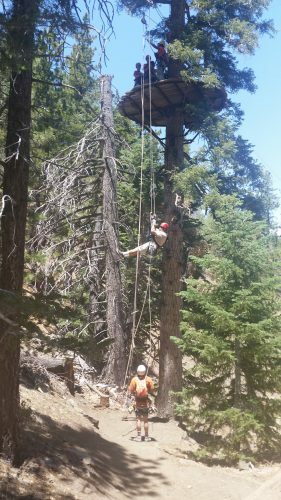 Ziplines at Pacific Crest in the San Gabriel Mountains, north of Los Angeles California, is an adventure course through the treetops. Not for the faint of heart, these are some high speed rides over heights that equal a thirty story building and lines that go more than a quarter of a mile in length. This is a great way to spend the day out in nature and enjoying a view you can get no other way. If you feel the need for speed and enjoy a thrill this is the place to be. They offer a couple of options to enjoy the excitement at Ziplines at Pacific Crest with their Canopy or Mountain View Tours. These half day adventures will take you above the San Andres fault and into the heights of the California mountains. If you can’t make up your mind between the two consider the Ultimate Day Package which includes both options and a provided box lunch and drink. Mountain View Zipline Tour – this package is made up of 6 ziplines, 2 free-fall rappels, and 3 hikes that take visitors through the countryside in a 2.5 hr. trip. Canopy Tour – this 3.5 hr. course includes 9 ziplines that reach 306 ft in height and run as long as 1500 ft. Crossing 3 bridges, lowering yourself down 2 rappels, a sky stair, and 3 hikes round out this route. Either choice or both will give visitors an adrenaline rush. Even the van up to the start point will get you going with a rumbling ride. From there it is a continued climb on foot to the first launch. After the guides run through the basics of braking and safety details you are ready to fly. I felt some butterflies with the anticipation of my first run and before some of the other elements that make up the course, like rappelling. In between the zipping visitors get a hawk’s eye view from decks in the tree tops. Our Canopy Tour even saw a pair of red tailed hawks checking out the featherless high fliers. Our guides, Ray and Will, pointed out the different trees, wild life, and were very informative about more than just the ziplining. 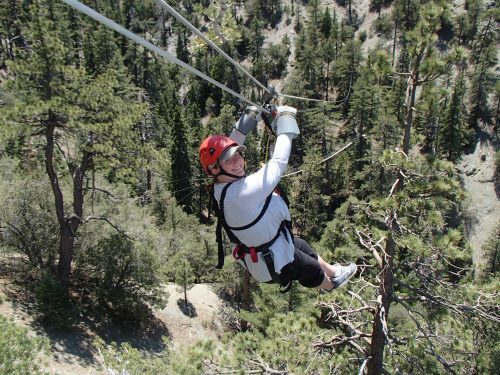 Reaching speeds of up to 55 MPH while dangling from a line mid air is an experience to remember. Perfecting braking and landing took a bit of work and I happily never failed to make it to the platform. Tours go all year round so be prepared that no matter the weather you can hit the trail. Participants from ages 10 to 80 are said to have completed the course, so as long as you fall between 90-250 lbs. you can join in. 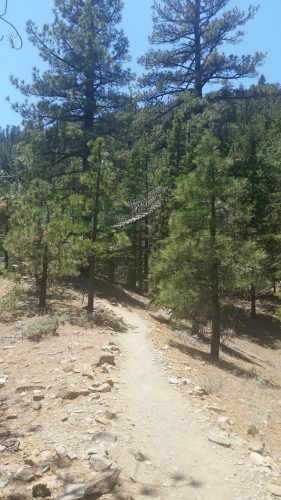 The instructions warn that participants need to be able to walk 1 mile as part of the course, but keep in mind that is a mile at 7,000 ft. So those with altitude issues be prepared for the added challenge. Comfort with heights helps as well since the treetop stops between lines are sunny spires above the arid mountain side. Even the bridges are a heart pounding part of the adventure. Check the Ziplines at Pacific Coast site for specials like the June “Buy one tour, get the second tour 1/2 off“ with the code BOGOZIP or their newest adventure, a night time Moonlight Tour! For the full moon July 7th & 8th you can fly under the stars after watching the sun set in the mountains. This is an outdoor event that will not disappoint. 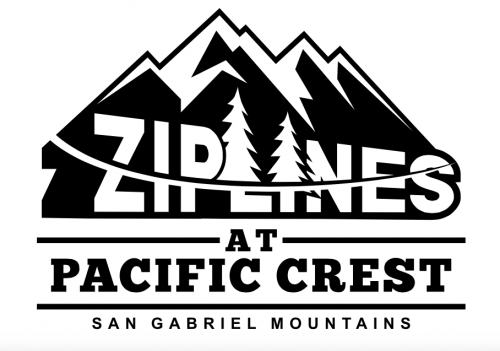 Contact Ziplines at Pacific Coast to book a tour on their site, ziplinespc.com or find out more about them on Facebook and Instagram.